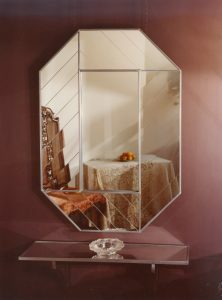 The frame, banded in lead, is a fantastic border of parqueted and faceted mirrors. Each piece is hand cut and polished. Together they refelct a pattern of multiple images. Previous Post:#5285 Grand Federal Rondel 33″ diam.